Need an idea for a gift and don't know what to get? 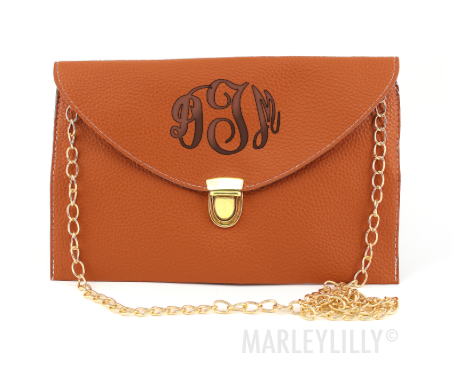 Marley Lilly's monogrammed gifts are an excellent, personalized solution for any occasion! With such a wide variety of products, you'll be able to find a custom gift for all the special people in your life! 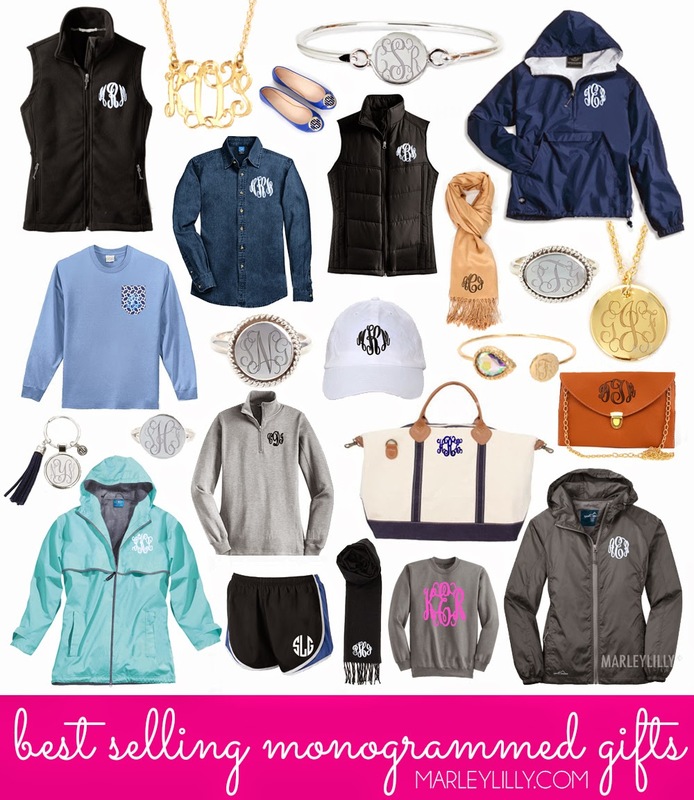 Browse through our best sellers and get a personalized, monogrammed keepsake for yourself or loved on today! 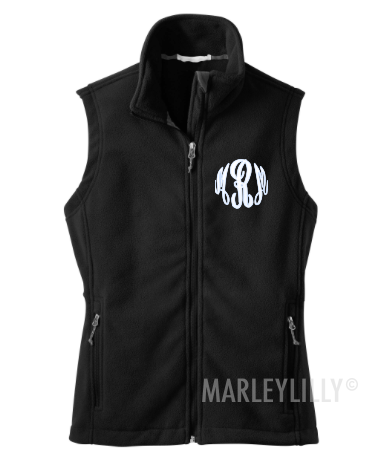 This exceptionally soft monogrammed fleece vest will keep you warm during everyday activities! It has a gently contoured silhouette and twill-taped neck for a flattering look on all body types. The custom vest also features bungee cord pulls along the bottom hem for fit adjustment, a full-length zipper up the middle and front zippered pockets on either side and two interior pockets. Made of 100% Polyester. 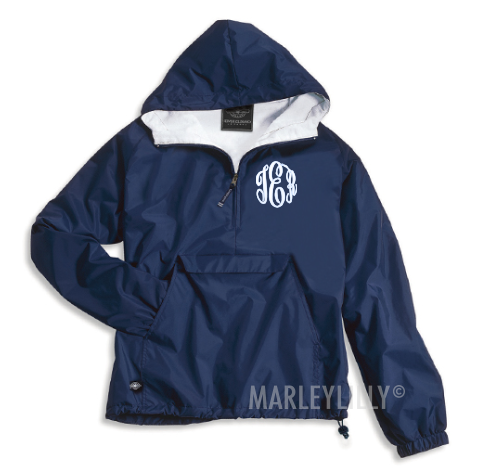 Monogrammed Pullover Rain Jackets are our favorite rainy accessory! This jacket is wind and water-resistant with flannel lining throughout for softness. It conveniently packs into its front pouch pocket for storage. This jacket features an extended zipper above the neck that offers extra protection against wind. It has front pockets, elasticized cuffs, and an open hem with shock cord drawstring. Keep in mind this is a unisex jacket; therefore ladies may find the item a little roomy, so please order sizes accordingly! Made of River Tec Nylon and 100% Cotton. This might be our favorite cross body bag! The Luxe clutch is made of synthetic leather and has a pebble finish to the material. The hardware is gold in color and there is a removable strap so the bag can be carried as a personalized clutch or a monogrammed cross body bag. The Luxe Clutch measures 11 by 7 inches and comes in a variety of bright colors. Each bag has a different color trim as you can see by the photo. The trim color is not very obvious, but it is a nice detail that adds to the Luxe feel of the bag! Inside there is a snap closure to help keep important items inside the bag! This Sterling Silver Monogrammed Zara Ring has an oval engraving plate that measures approximately 13mm tall and 16mm wide with a braided rope accent around the edges adding just a touch of flair! 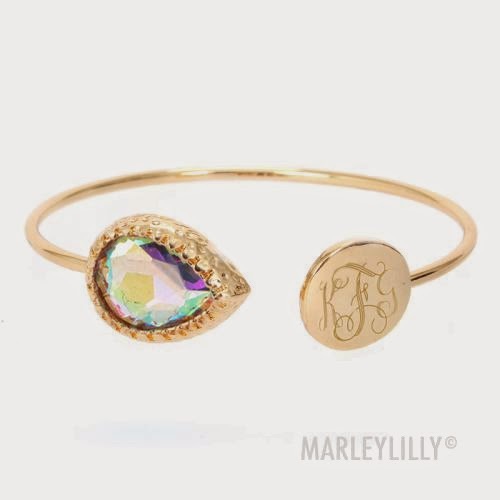 This ring is perfect for everyone and adds the perfect touch to any outfit! Makes a great gift as well!!! 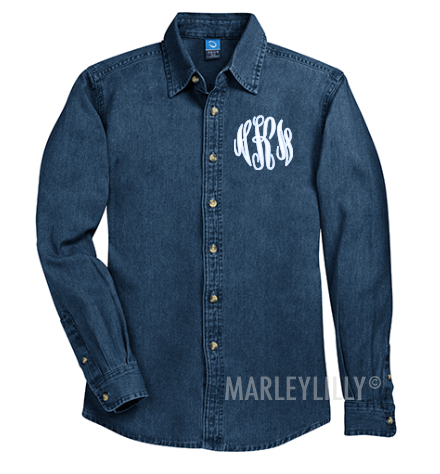 With sturdy construction, a generous cut and soft garment washing, our monogrammed long sleeve denim shirt look great dressed up or down! This custom shirt features horn-tone buttons, button-through sleeve plackets and adjustable cuffs. The tuck-in tail can be tucked in for a more dressy look or left out with leggings. Please note that due to special finish processes, the denim color may vary. Made of 100% Cotton. 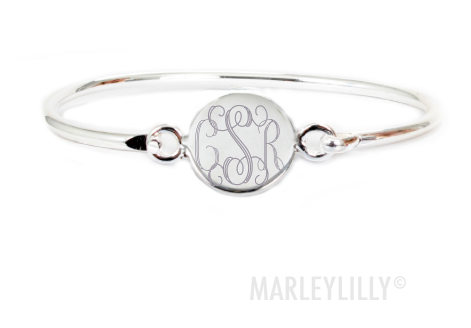 This Monogrammed Taylor Bracelet is timeless and classy! Featuring a circular monogrammed disc measuring approximately 3/4 inch, this custom bracelet has a circumference of about 9 inches!! Available in silver or gold tone, this bracelet is sure to match any piece of jewelry you already own! Makes a great gift for any woman in your life! Pair this with our taylor ring and necklace to complete the look!! 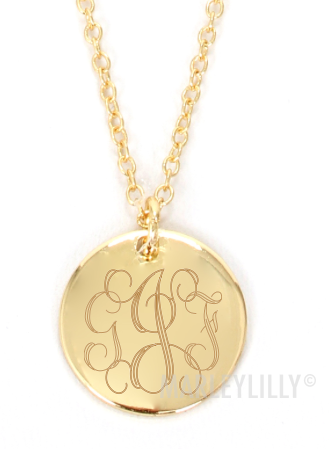 This Monogrammed Taylor Necklace has a simply classic circular monogrammed surface measuring approximately 7/8 inch!! Available in silver or gold tone with an adjustable chain, this necklace is sure to match any piece of jewelry you already own!!! Makes a great gift for any woman in your life! Pair this with our taylor ring and taylor bracelet to complete the look! Monogrammed Puffy Vests are the ultimate preppy winter staple item! They are great for layering over a long sleeve shirt, a preppy sweater or under a jacket. 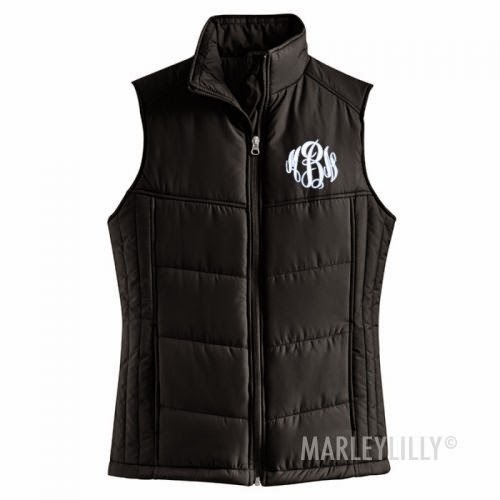 This personalized puffy vest features two front zippered pockets and two interior pockets. There is a drawstring with toggles located along the bottom hem for fit adjustments. These vest fit true to size so we suggest ordering the same size you typically wear in women's outerwear. Made of 100% Polyester. Available in SIX colors, sizes XS-4XL. 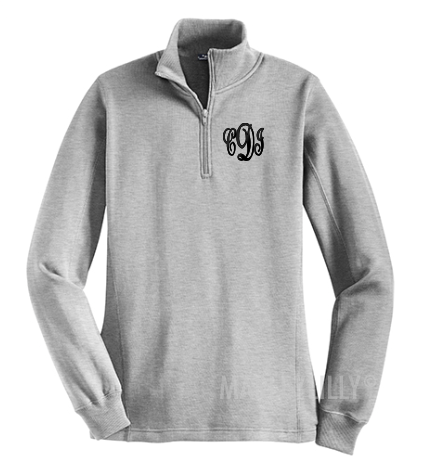 This Monogrammed Pullover Sweatshirt has a stylish feminine fit and features a 1/4 zip. Considered a casual essential, it has a rib knit collar and cuffs with a zipper dyed to match the fabric color. This sweatshirt is made true to size so we suggest ordering your current size. Made of 60% Cotton and 40% Polyester. Available in EIGHT colors, sizes XS-4XL! 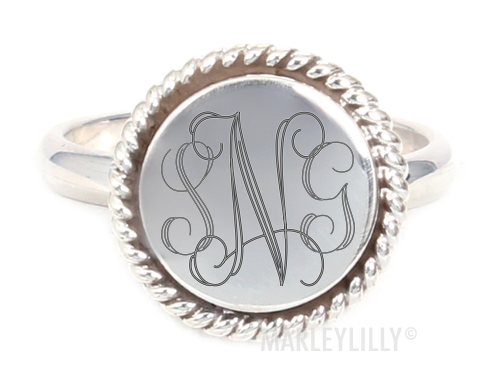 Our Sterling Silver Monogrammed Nala Ring is the perfect compliment to any outfit! Whether dressed up or dressed down, this round ring with a braided rope boarder is a great addition to any look! Measuring approximately 1/2 inch, this ring is the perfect size for everyone. Also check out our matching Nala Necklace and Nala Earrings to complete the whole look! Available in whole sizes 4-10. This great stone teardrop bracelet is such a great piece! 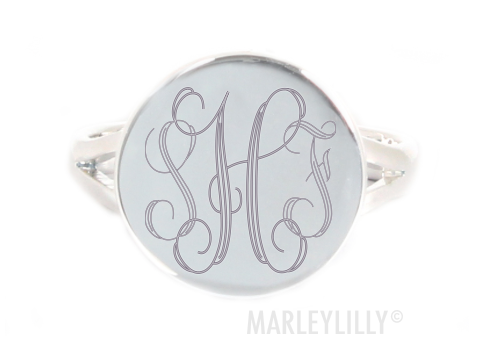 The circle disc is approximately 5/8 inch, so your monogram will be just the right size to get noticed! Available in four stone colors, this bracelet will compliment every outfit!! Wear it alone or with other bracelets to create your own individual look! The approximate circumference of this bracelet is between 7 to 7 1/2 inches! Available in 20+ colors. 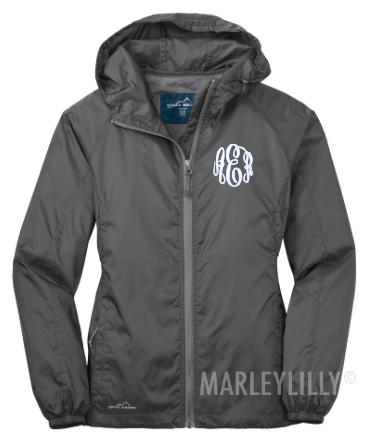 Our Monogrammed New England Rain Jacket is 100% wind and waterproof. This jacket is lined with grey mesh for airflow circulation and its lined sleeves provide easy on/off dressing. 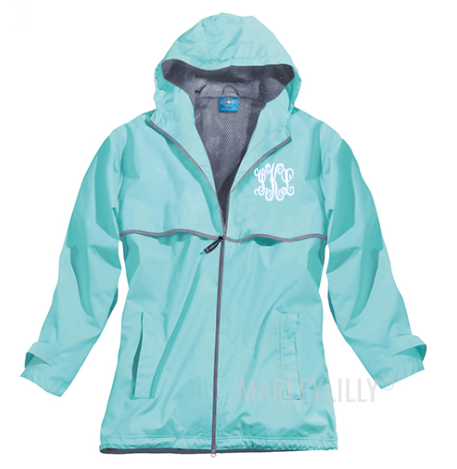 The hood and open hem of this jacket feature shock cord drawstrings for fit adjustment. This jacket has front-vented capes for breathability and easy decorating access. It also has a reflective stripe accent on the front and backsides, and a 2-way front zipper for freer movement. Additional features include: covered zippered side pockets, adjustable cuffs with hook and loop closure, and A-line styling. Made of bonded Polyurethane, mesh, and Taffeta Nylon. Available in SIX colors. 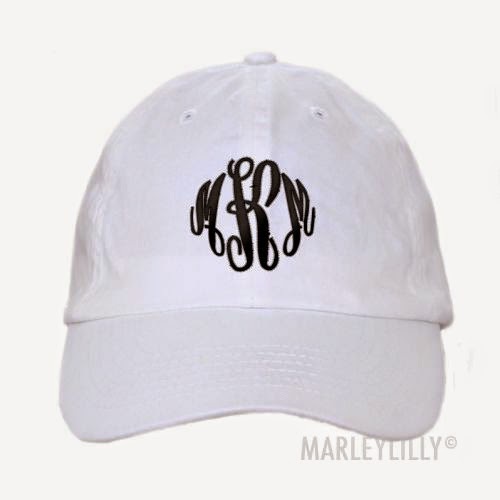 Look cute and sporty in a Monogrammed Baseball Hat! They are great for sun, fun, and bad hair days. Available in a variety of different colors, they make wonderful gifts for anyone! These cotton twill hats have a great brushed look and are super soft. While the majority of these custom hats have a metal clip, the hot pink and aqua baseball hats have a velcro closure back. Available in 10+ Colors! 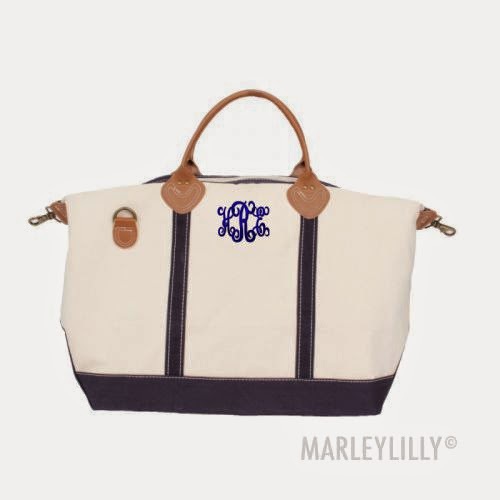 With our Monogrammed Sunshine Satchel Duffel Bag, you can travel in style! With two quick snaps, you can change your satchel into a duffel bag. Featuring one large zippered pouch and two slide-in-easy-access pockets. You can use the 15” short, strong leather handles or the long, adjustable canvas & leather strap for carrying. Want to take the long strap off completely? Sure! – just unsnap the side rings. Measuring 15” x 28” x 10”. Made of 20 oz. Cotton Canvas. Available in FIVE colors! 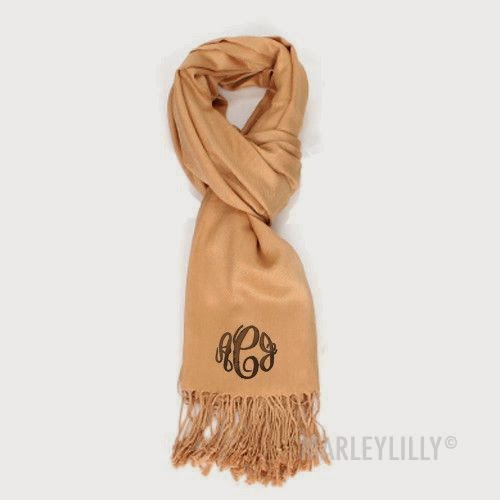 Keep warm with one of these Monogrammed Cashmere Feel Scarves! Made of a super soft acrylic material, they feel warm and cozy against your skin and help block the cold on those nippy fall and winter days. Each scarf measures 12 inches wide by 70 inches long, however these measurements can differ slightly from scarf to scarf. 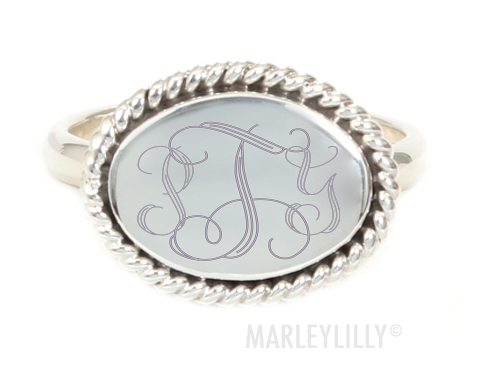 The monogram will be approximately 3.4" wide depending on the font chosen! Choose between our numerous colors and patterns to create your unique scarf! Available in 30+ Colors! These personalized scarves are wide and made of 100% super soft acrylic. These are 190 gram pashminas and measure approximately 28x70 inches. If you are a super picky person and looking for a perfect monogram, we would suggest going with the cashmere feel scarf. Since this is a knitted material, you are not going to get a PERFECT shaped monogram. Due to the woven nature of a pashmina and the tight stitching from an embroidery machine, there will be gaps in the pashmina fabric around the letters. 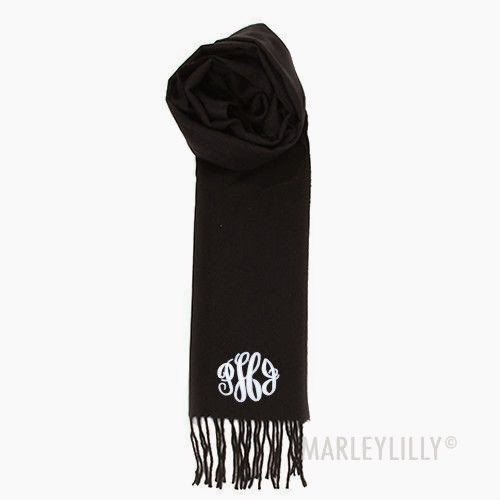 These monogrammed pashmina scarves are adorable and are a great weight so you can wear it without feeling like there is a ton of fabric around your neck. Available in 20+ colors. 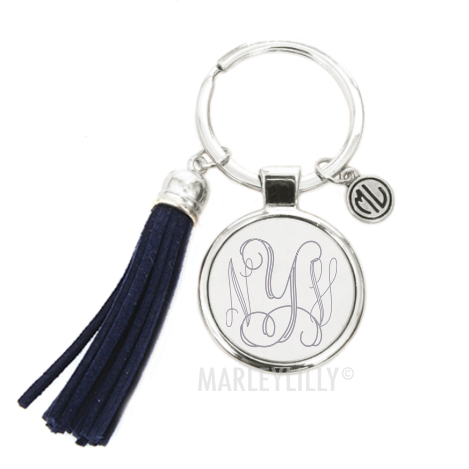 Spice up your key ring with one of our Monogrammed Tassel Key Chains! This key chain has an engravable disc that measures 1 3/8 inches with a 2 inch tassel in the color of your choice! Just the right size to be noticed without overwhelming your chain. Keep in mind, the engraving on this item is subtle. For the best visibility, we suggest the Interlocking font. Available in 20 colors! 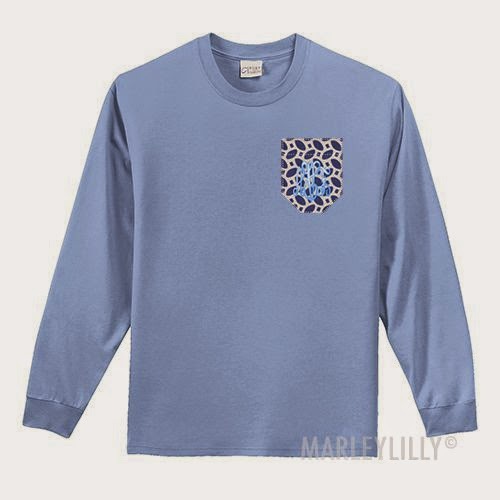 Monogrammed Long Sleeve Crew Neck Stitched Pocket T-Shirts are must have in your closet! The preshrunk cotton shirts fit pretty true to size. If you normally wear a medium in a t-shirt we would expect you to wear a medium in this shirt. The shirts are of very nice quality and are made of 100% Cotton. Please note that while the top of the pocket will be open and not sewn to the shirt, the stitch line right above the monogram will be sewn to the shirt, which makes the pocket unusable. It will not appear completely sewn to the shirt, but you won't be able to store your nick knacks inside. 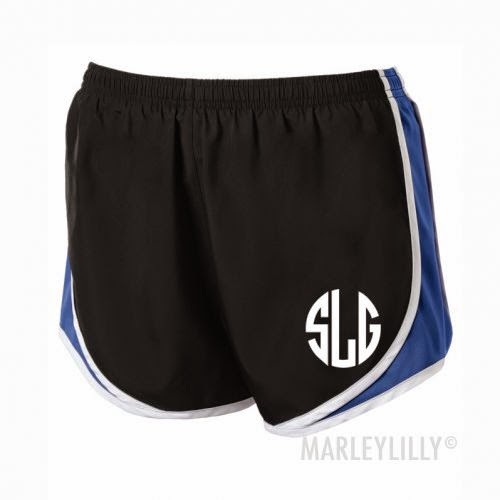 These Monogrammed Running Shorts are the perfect gift for the girl that has everything! For training or relaxing, our feminine shorts keep pace with high-performance moisture control. Tricot side panels provide breathability and add athletic style. The shorts feature an elastic waistband with a drawstring tie and an internal pocket to hold smaller items. Made of 100% Polyester. Available in 11 Colors! Care Instructions: Do not use fabric softener when washing these running shorts. It could cause the monogram to peel off the shorts. These shorts are not embroidered. 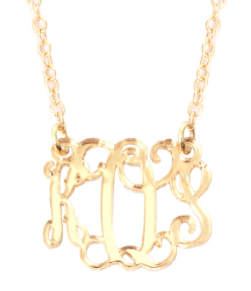 Our floating Monogram Acrylic Cut Out Necklace comes in a variety of colors, so you are sure to find the perfect one to compliment your look! Pricing varies depending on the pendant size! We have Small, Medium and Large styles available, plus you can select a gold or silver tone adjustable chain! These necklaces make the perfect gift for everyone!! 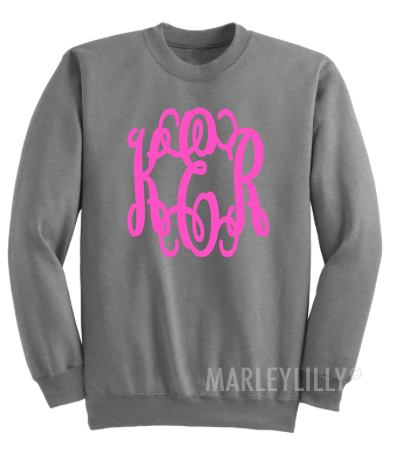 This traditional Monogrammed Crewneck is the perfect preppy sweatshirt for everyday wear. It features a ribbed seam neckline, wristbands and waistband that stretch for a more comfortable fit. This item is a traditional unisex sweatshirt. Made of 50% Cotton and 50% Polyester. Available in 12 colors! Care Instructions: Do not use fabric softener when washing this shirt. It could cause the monogram to peel off. This shirt is not embroidered. Wind was the inspiration for this Monogrammed Eddie Bauer Windbreaker with its compact layer that packs down into a pocket, making it easy to carry wherever you go. It features a hood with draw cord and toggles for adjustability, underarm vents and front zippered pockets. The cuffs are elastic, providing a close fit and more insulation in the arms. There is an Eddie Bauer Logo along the bottom hem of the jacket. Please note that this custom jacket is water resistant but not waterproof. We would suggest that you not wear it in the rain. Available in SIX colors! Made of 100% Nylon. Introducing our NEW Monogrammed Ballet Flats! Perfect for the holidays, these personalized flats are available in a wide variety of adorable colors! The flats fit true to size. 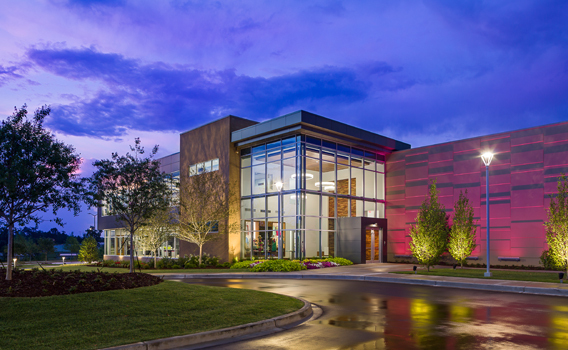 The custom flats are personalized with durable vinyl material. Would make a great gift for your loved one this holiday season! Available in FIVE colors!